Porgs do play, you know. 24-inch wide art print inspired by Star Wars: The Last Jedi. Signed by artist Joel Payne! This astonishing artwork inspired by Star Wars: The Last Jedi is a 24-inches wide x 16-inches tall canvas presenting artist Joel Payne's Porgs at Play. 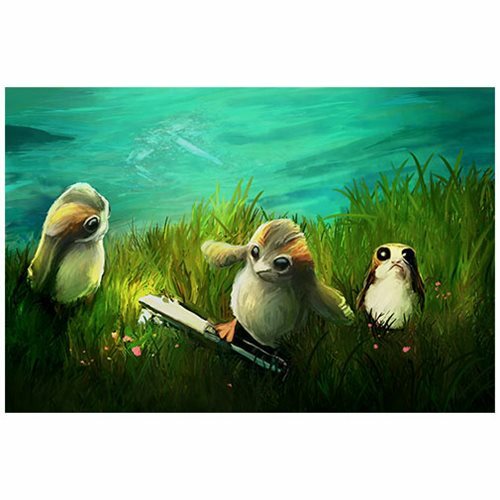 The Star Wars Porgs at Play by Joel Payne Canvas Giclee Art Print is an unframed limited edition of just 95 hand-numbered pieces! Signed by artist Joel Payne, and comes with a certificate of authenticity!